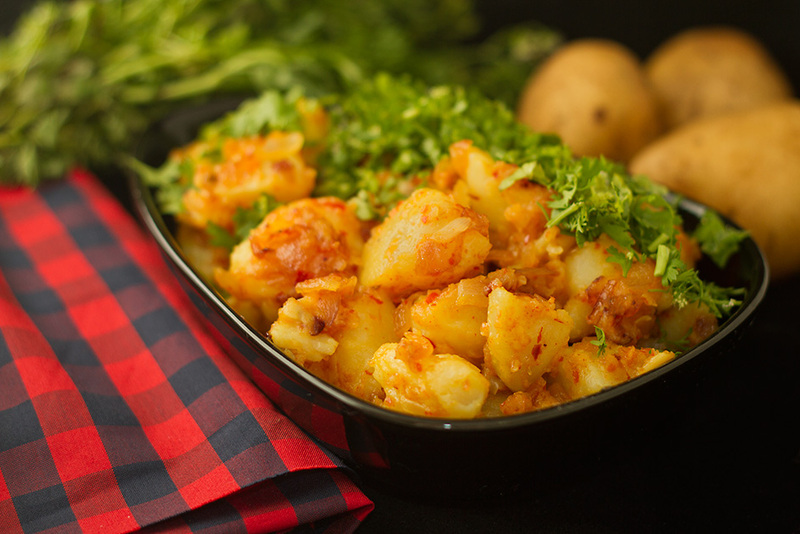 This recipe of Chili Garlic Potatoes, or Lahsooni Aloo as we call it, is from my mom’s kitchen. A quick stir fry of potatoes with chili garlic paste, garnished with lots of fresh coriander and you are ready with a dish that can be used as a snack with cold beer or as a side dish. In fact this quick potato dish is so versatile, you can team it with paratha (Indian flat bread) and hot chai and it will make a lovely brunch. If you do not have Whole red chilies in your pantry, use chilli flakes. A staple of Mediterranean food, Garlic is also a very important ingredient in Indian cooking. Garlic is widely used around the world for its pungent flavor as a seasoning or condiment. The garlic plant’s bulb is the most commonly used part of the plant. With the exception of the single clove types, garlic bulbs are normally divided into numerous fleshy sections called cloves. Garlic cloves are used for consumption (raw or cooked) or for medicinal purposes. They have a characteristic pungent, spicy flavor that mellows and sweetens considerably with cooking. A 2013 meta-analysis concluded that garlic preparations may effectively lower total cholesterol if eaten raw for longer than two months. Studies also suggested association between garlic consumption and lowering of the risk of Stomach and Prostrate cancer. One news source reported garlic supplements may prevent the common cold. Kashmiri Chile 1 large. The dried variety. Boil potatoes, peel and roughly chop them. Make a paste of garlic and red chile. Heat oil in a pan, add asafoetida, fenugreek seeds and stir for a few seconds. Add onions and fry till they start turning pink. As soon as the onions turn pink, add turmeric powder and garlic chili paste stir for 10 seconds (not more - just enough to mix every thing well) and add potatoes and sprinkle salt over the potatoes. Mix well and Fry the potatoes for 5-6 minutes and finish the dish off by garnishing with chopped green coriander. This dish is very versatile and can be served as a starter or a side dish. You can also eat it with Indian flat bread, the triangular paratha for breakfast or brunch.